Why not have a little whiskey with your tea? Smugglers' Notch Distillery spent much of the last two years in litigation with Campari Group, which produces Campari, Wild Turkey and Skyy Vodka, among other international liquor brands. At issue was a name: The Italian booze behemoth deemed the "Smugglers' Notch" in the Cambridge micro-distillery's moniker to be too close to its Old Smuggler blended whiskey, and took the tiny spirit producer to court over it. The litigants settled the case in May 2014. Smugglers' Notch can keep its company name, and spirits licensed before the lawsuit will retain their original branding, according to distillery owner Ron Elliott. But, going forward, any new "dark" spirits (anything that's not clear, basically) must be given a "fanciful or arbitrary name," and that name must be larger than the company name on any labeling. At the time, Elliott, along with his son and co-owner Jeremy Elliott, had wheat whiskey (some of it distilled on site) aging in barrels. They would have loved to release it "just following the lawsuit," the elder Elliott says, but the spirit needed more age. So they waited ... and waited. And this fall, the distillery bottled and labeled its Litigation Wheat Whiskey, an amber-hued sipper with notes of brandy, caramel and vanilla, rested three years in charred oak. Today, I made a caffeinated cocktail with it and dubbed it the Litigious Whiskey Grey, so named for the lawsuit and tea that is its main mixer. *Cider syrup takes about five minutes to make and is a fun seasonal twist on simple syrup. It's great in all sorts of cocktails, including this gin fizz I made in October. Mix equal parts fresh apple cider and sugar with fresh herbs (rosemary and sage are best) in a small saucepan. Heat over low flame, stirring often, until the sugar dissolves. Pour into a lidded container and refrigerate for up to two weeks. Brew two teabags in two cups of water and allow to cool. 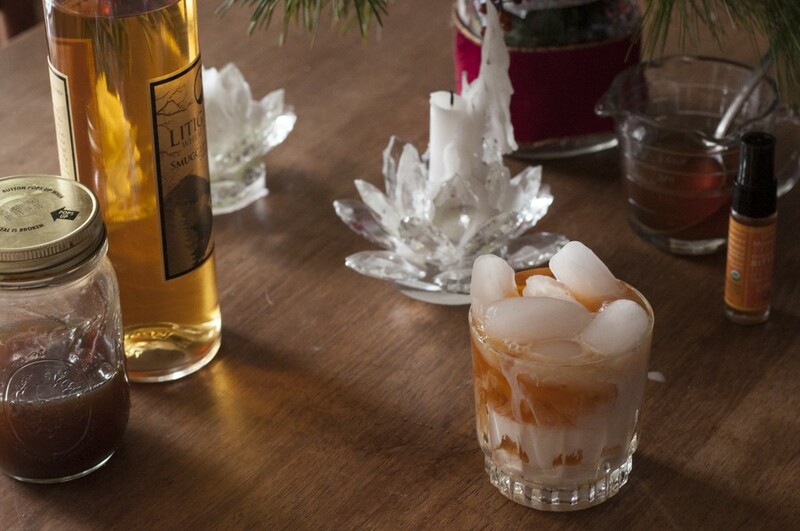 Pour the whiskey, syrup and 2-3 ounces of cold tea into a cocktail shaker and stir. Fill a rocks glass with ice and pour the whiskeyed tea over. Top with half & half, as you would a cup of coffee or hot tea. Spritz with bitters and enjoy!